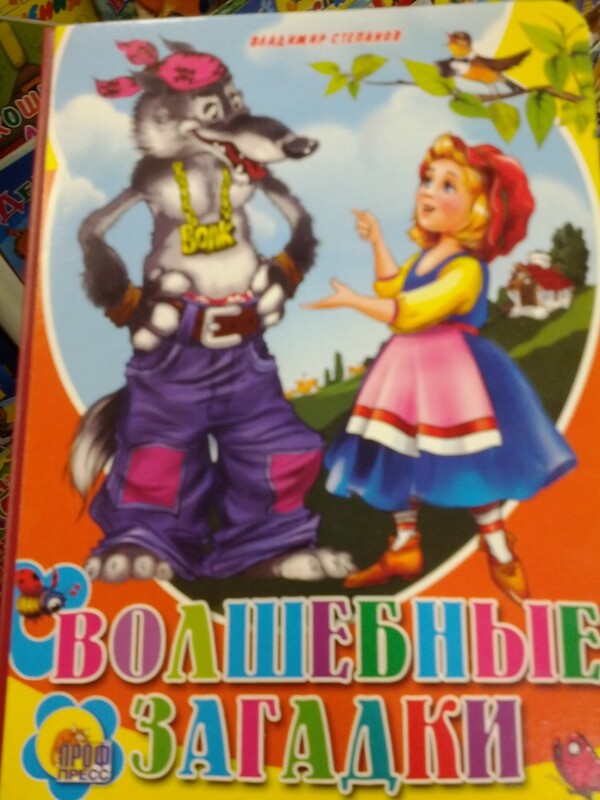 So, the other week, Mr. B and I were trolling around in the local Russian bookstore. It’s actually very cute because it’s called “Knizhnik,” which loosely translates to “Booker,” from the word for book, knizhka. It’s named after the owner, whose last name IS actually Knizhnik. With a last name like that, I can only imagine you’re destined either for book store ownership or tax evasion. Anyway, none of that was relevant to the picture I’m about to show you. Brace yourselves. This book is titled “Magical Riddles,” but the only riddle I have is why the hell the wolf on the cover of a book targeting the 3-7 age group is dressed like Tupac Shakur? With his own bling, which reads “волк ” or wolf in Russian. I have no explanation for this cover illustration and why it’s appropriating American gangsta rap culture. More importantly, if the wolf can afford bling, why can’t he afford a nice pair of Prada pants without patches, like Kanye? Is it because the illustrator is trying to show that, while daddy has a Boomer and a 14-k gold nameplate he’s still relatable to the proletariat? But while you’re puzzling over that, there’s another Russian children’s series I’d like you to check out. It’s called Tanya Grotter and it has no resemblance at all to anything in English-speaking culture whatsoever. This pacticular book is called “Tanya Grotter and the Hammer of Perun,” Perun being the Slavic pagan deity of fire, mountains, and plagiarism. I can just imagine a marketing meeting where the publishers of these books got together. “How can we sell our own rich literary culture, spanning back hundreds of years and including such beloved Russian children’s authors as Marshak, Barto, and Nosov?” One suit says to another.